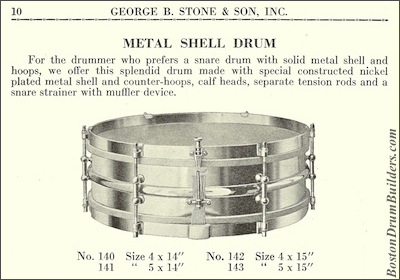 It would be an overstatement to say that a single snare drum model from a single manufacturer put George B. Stone & Son out of business. 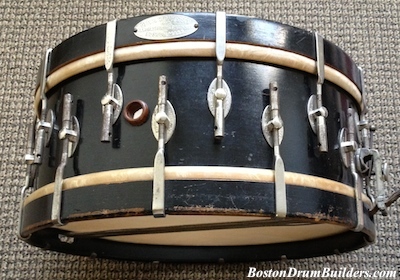 But when an old friend from the East Coast recently sent an early Ludwig & Ludwig nickel-over-brass shell Universal model snare drum my way, it occurred to me that none of the Boston Drum Builders ever produced anything like this even though many of the companies were operating simultaneously through the 1910s. It isn't so much that Ludwig & Ludwig's metal snare drums of the 1910s were head and shoulders above Stone's drums, it's that the drums coming out of the Ludwig factory in Chicago were completely different instruments altogether. As Ludwig and their Midwestern counterparts evolved quickly through the 1920s, Stone & Son practically stood still. For example, short of the elusive All Metal Master-Model Drum, Stone installed wooden hoops on virtually all drums built in house for the entirety of the company's existence. And that is just the tip of the iceberg really. Geo. B. Stone's famous Master-Model Drum (pictured at bottom right), introduced in 1922, used a visually striking yet completely impractical tuning method that involved using a wrench around the sides of the drum to adjust the tension of the heads. Again, this was not a forward looking evolution but rather a throwback to old fashioned ways which only served to put Stone further behind the curve. Ultimately, designs such as Ludwig & Ludwig's All Metal Drum (pictured at bottom left) caught on and became the industry standard. 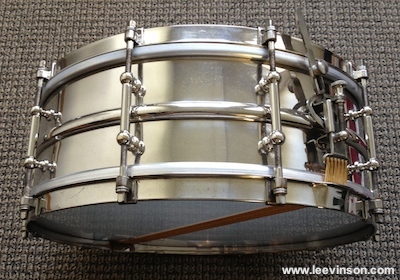 The Universal Model (pictured at top right) was actually Ludwig's more affordable metal shell snare drum through the 1920s by which time their flagship models implemented ten tube lugs and either the Professional of Super-Ludwig throw-off. 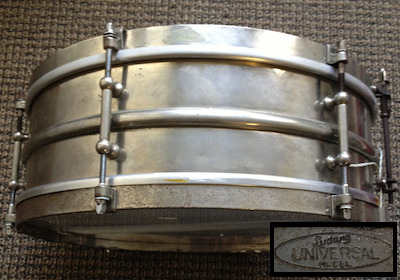 Stone did eventually catalog a metal shell snare drum similar to the Ludwig & Ludwig Universal but these were admittedly not built in house. The metal shell drums sold by Stone were instead purchased from a third party (possibly Leedy or Duplex, or perhaps even from Ludwig themselves as Stone did carry the Ludwig & Ludwig bass drum pedals) and distributed through Stone's dealers which were predominantly in New England. Note that Stone was cataloging a six lug drum in late 1924 by which time Ludwig had already moved to the more sturdy eight and ten lug designs. With Ludwig & Ludwig's highly advanced Super Ludwig models in production by this time, literally all of Stone's offerings including their Master-Model and Separate Tension Drums had become obsolete almost overnight. You be the judge. Which of the snare drums pictured below look to you more like the instruments we play today?